I received this book through the GoodReads First Reads program in exchange for an honest review. Everyone is happily checking their email, updating their blogs, poking people on Facebook, and tweeting what they had for lunch when the unthinkable happens. The Internet disappears. No one knows where it went. Servers work, Wires are still plugged in. The Internet has just disappeared. 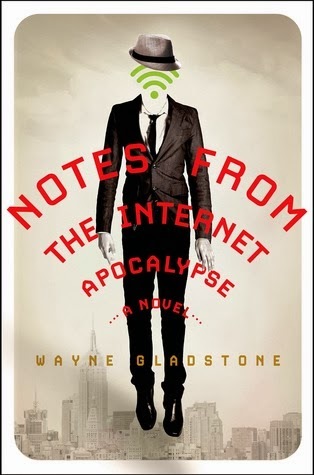 The protagonist, Gladstone, goes on a journey to find the Internet with his two friends. On their journey, they meet a man who calls himself Jeeves (askjeeves.com), hang out in the Rule 34 Club (where you can watch anything you want...), and real-life Reddit circles (people take turns standing in the center of a circle of people and recite news they know). This book is based on a short story Wayne Gladstone wrote. This is one wild satire that you are going to find horribly offensive, quite funny, or very confusing. If you are okay with crude satires and are familiar with terms like Anonymous, Facebook, Rule 34, Reddit, and Ask Jeeves, this is the book for you. To be perfectly clear, this book shows what the underbelly of the Internet looks like if it left the safety of the Web and had to work in real time and in real life. Some of the situations in this book are quite funny, and I found myself laughing out loud. Some of the other situations in this book are a bit more crude than I like, so I didn't find them as funny. All of these situations, both the ones I liked and the ones that I didn't, work well within this satire. In regards to the story, I felt that the pacing was a bit off. Sometimes the story really worked and moved along nicely, other times the pacing dragged. This ebb and flow in the pacing might be due to this book originally being a short story. Gladstone might have had a hard time figuring out how to expand this story into a full-fledged novel. At the same time, this book is less than 300 pages, so the slower periods of the book don't last very long. The characters in this book were interesting, and I found them to be a bit deeper than I usually see in a satire piece. I found myself becoming invested in their adventure when I typically don't in satires (I usually just read satires for the concept, not the characters). The characters aren't necessary likable; however, they work well within this wacky universe. Overall, I enjoyed this book. It was quite funny at times. At other times, it was a bit crude, but the crudeness works well within the realm of the story. As I stated at the beginning of the review, this book is for a particular audience. If this sounds like a book for you, I suggest that you give it a go!